Home / Cremation Urns / When is the best time to buy a funeral urn? When is the best time to buy a funeral urn? This is one of those purchases that may quite suddenly and unexpectedly become very important to you and your family. Right now, you may be reeling after the loss of a loved one and searching frantically for a wide variety of funeral products and services. Or perhaps you are – wisely – beginning to plan ahead for your final arrangements. Whatever may be your situation, we have some helpful information for you below. When should I buy a funeral urn? Each period has its advantages. Yes, even the stressful “right when you need it” category. Let’s take a look at each. This is the planner’s choice, the “always be prepared” expert’s option. 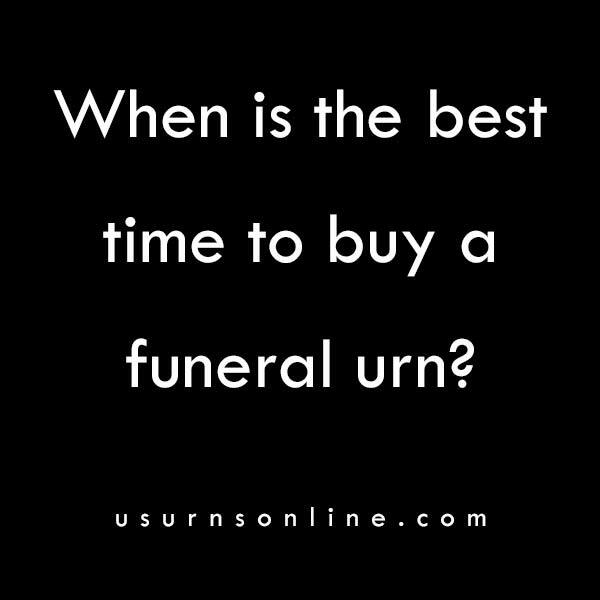 If you’re one of these types, you know you’re right: Buying an urn before you need it is the best time. You have time to research the options for things like scattering, whether to keep the urn in your home or bury it at the cemetery, the types of materials you prefer, and the theme or design that best represents you or your loved one. You can also save money by purchasing in advance. Many retailers – like us – offer free delivery on most orders, so you won’t have to pay extra for expedited shipments. Plus you won’t have to worry about rising costs due to inflation. Not everyone has the luxury of planning ahead, especially if the funeral arrangements for someone else unexpectedly become your responsibility. If you’ve found this article, this is probably where you are at: The funeral or memorial service is fast approaching, and somebody has to find a cremation urn that everyone can agree on and have it delivered with time to spare. Stressfull! Fortunately, there are plenty of options for this scenario. You can always purchase an urn directly from the funeral home, where you can choose from a number of stock items or order something that will be delivered quickly. You can shop online and choose from an incredible array of options, materials, designs, and sizes. Many of the items you find online can ship out within a few days, and be delivered soon afterwards. And of course many websites offer expedited shipping methods, however those do tend to add to the overall cost. The downside to having a short amount of time means that many of the more unique and creative funeral urn designs take time to produce and personalize. For instance, an artisinal handcrafted ceramic urn can take about 3-6 weeks to produce, and hand-turned wood urn might take about a week. If you’re feeling overwhelmed about making this decision, be sure to read the next section about buying an urn after the memorial service for additional options. However, this doesn’t mean you can’t get what you want. Our customer service experts are always willing to work with you and your family’s timeframe to figure out how to ensure production and delivery of just the right item at just the right time. Sometimes we can dip into an artisan’s back inventory, suggest a slightly different finish, or help you find a different design that you like even better but didn’t initially find in our vast selection. So don’t hesitate to contact us to help you arrange the details! Many people look at the short window between a loved one passing and purchasing the urn as a downside and source of stress. But this doesn’t need to be so! We had many customers comment about how surprisingly easy and stress-relieving our help has been. Having the impetus of an upcoming memorial service can provide helpful motivation. And if there will be more than just you selecting the urn, having the family gathered at or near the time of death can be an aid in selecting the urn – rather than emailing or texting link and photos, you can all gather together and go through the selection process together. Face to face interaction is almost always more clear and the best way to avoid the unneccesary friction that can arise through misunderstood tones, unanswered texts, and missed voicemails. Did you know that you can (almost always) rent an urn from the funeral home for use during the memorial service? Many people are not aware of this option. If you are looking for just the right urn in the wake of an unexpected death, you may feel that the options available to you within a few days or weeks are not enough. That’s okay! For less than the cost of overnight shipping, you can simply rent an attractive and respectable urn for the service. Then, at your own leisure, you can browse through the many unique and creative memorial urns that are hand crafted, made to order, custom made, personalized, or hard-to-find. So, when is the best time to buy a funeral urn? In our humble opinion (having spoken to thousands of people in all walks of life who are shopping for a cremation urn for their unique situation), we think that it’s best to prepare and get yours or your loved one’s in advance. If that is not possible, we are more than happy to work with you on getting the urn you want delivered in the timeliest way possible. And if the situation allows you can rent a temporary urn and take you time after the service to find the memorial that is best. We hope this helps!